Där är jag i hamn – hundra(ett faktiskt, glömde mig och bloggade två gånger en dag, fast jag normalt bara bloggar en gång/dag) blogginlägg senare på lika många dagar utgör slutet på årets resa av #blogg100. Första året var det en utmaning. Ojoj, som jag slet. Från att ha bloggat cirka 10-15 inlägg på ett knappt halvår, till att blogga dagligen. En pärs. Åtminstone första månaden kanske, för sen vande jag mig, hittade rutinen, fick upp ögonen för en massa intressanta saker att skriva om. Så är det fortfarande, att jag tycker det finns massa intressanta saker att skriva om. Faktiskt så många att jag samlar på dem i min Evernote under taggen #bloggidé. Ofta sätter jag mig ner utan att egentligen ha en plan för dagens skrivande, men det brukar vakna något inom mig, och ett tu tre finns det ett inlägg att publicera. Andra gånger sätter jag mig ned med en tanke som sedan utvecklas sig själv ner på pränt på något vis, nästan som kommer det genom mig snarare än av mig. Och någon enstaka gång är det stillestånd. Då är Evernote-arkivet guld att ha, och så löser det sig ändå liksom. Andra året var mindre av en press, eftersom jag med några få undantag faktiskt då hade bloggat dagligdags sedan första #blogg100-utmaningen. Likaså i år, där det bara rullar på. Men på ett bra sätt. Jag tycker om att skriva ned tankar och funderingar, jag upptäcker saker om mig själv och världen under de här stunderna vid tangentbordet. Och igår publicerade jag mitt niohundrade blogginlägg. Om man betänker bloggfrekvensen jag hade innan jag upptäckte #blogg100 år 2013 så hade det talet kanske, möjligen, eventuellt, legat runt 50-100 inlägg vid detta laget. Nu är det inte 900 mästerverk som jag publicerat, men det finns några inlägg som jag tycker är riktigt fina, vissa som slagit an en sträng hos många läsare, och ett par stycken som jag gläder mig alldeles extra åt. Under årets #blogg100 är de tre mest lästa inläggen på min blogg alla direkt relaterade till skolan. Och det är på sätt och vis roligt, eftersom jag bryr mig ofantligt mycket om skolan, brinner för skolutveckling, och har mycket tankar i fråga om lärande. Samtidigt som jag skulle bli väldigt glad om vissa av inläggen som inte direkt kopplar till skolan lästes av just skolfolk, för det finns mycket att fundera över som knyter an till skola och lärande, om än inte direkt uttalat. Det allra mest lästa inlägget handlar om mitt besök på Lunds Waldorf-skola. Därefter mina tankar om en lärares vardag, skrivet som en reflektion kring alla de skolmänniskor som jag kommit väldigt nära under årens lopp. Och sist, men definitivt inte minst, inlägget om Barn i Behovs oerhört viktiga föreläsning från Anhörigriksdagen i Varberg i maj. Tack för denna resan #blogg100 – kanske ses vi 2016 igen? I can’t help it. Here’s another On Being-episode that I so hope you will listen to. Krista Tippett in a conversation with Jean Vanier, an episode recorded in 2007 when he was 79 years old. Jean is the founder of L’Arche, just having celebrated it’s 50th anniversary, hence the re-broadcast of the interview. And I am grateful for that, since I might not have discovered this particular episode in the archives of On Being otherwise. The balance of our world frequently is seen as a question of power. That if I have more power and more knowledge, more capacity, then I can do more. […] And when you have power, we can very quickly push people down. I’m the one that knows and you don’t know, and I’m strong and I’m powerful, I have the knowledge. And this is the history of humanity. And that is all of what I’d call the whole educational system, is that we must educate people to become capable and to take their place in society. That has value, obviously. But it’s not quite the same thing as to educate people to relate, to listen, to help people to become themselves. There’s something to ponder, for me, and others, of whom I ask the question Why school? The reason for asking, for me, is to get people thinking about the society we create, through the whole educational system (as well as other structures, but for me, the educational system and family are the top two factors. ), and if we are creating that which we want to see more of. Like Jean Vanier said, capable people taking a place in society is all fine and dandy. But then what? What else is needed/desired? L’Arche, which centers on sharing the lives of people with intellectual disabilities, is new to me, as Jean Vanier is. I get intrigued, as I listen to what Jean speaks about, which is the thing I dream of. A world of people becoming themselves, relating and listening, sharing tenderness and love. A culture of welcoming. To and of all. Fascinating to listen to the wisdom of tenderness this old gentleman has, towards life, all of it, regardless. And to hear him speak of growing older, and absolutely loving it. Witnessing the increasing frailty of his own body, being in total acceptance that his mind no longer can keep up as it used to, that his body demands an afternoon nap and so on. It’s just pure love. Magnificent. What if…. I met the world from the wisdom of tenderness? What if…. we all did? On one of the first weeks of the Create the impossible-course the theme was Be creative. Michael Neill spoke in the daily audio on creativity, giving different assignments, one of which was to create something from nothing. Overall, the entire week centered around creativity. And you cannot imagine the magnificent examples of creativity that my fellow classmates birthed and shared with the rest of us. There were songs, blog posts, paintings, elaborate meals, and also a lot of headway of the various create-the-impossible-projects of people in the group. The energy was mostly light, bright, bouncy and joyful, with a lot of play and openness as to what wanted to be created. Then a few weeks later, the weekly theme was Take action. Michaels daily audio gave instructions to take action, even to take massive action, to just-do-it, and really get down to work, so to speak. Is it really appropriate to force myself into action? What if I don’t feel like taking action? Should I really force myself into it? Will I take the correct actions if I force myself, or will that mean I’ll be working against my intuition? Well, you can probably hear my inner dialogue spinning around and around on this, with a lot of judgement thrown in, ideas about right and wrong, and a fear of going down the wrong path. Then something happened. Michael spoke about the theme of the Take action-week during the weekly phone-in-session, and I was reduced to hysteric giggles at how silly I’d been. Because what Michael so aptly pointed out, is that being creative and taking action, are really jusy two different ways of talking about the same thing. I had a huge Homer-Simpson-moment when that hit home. Because he’s right. It is. 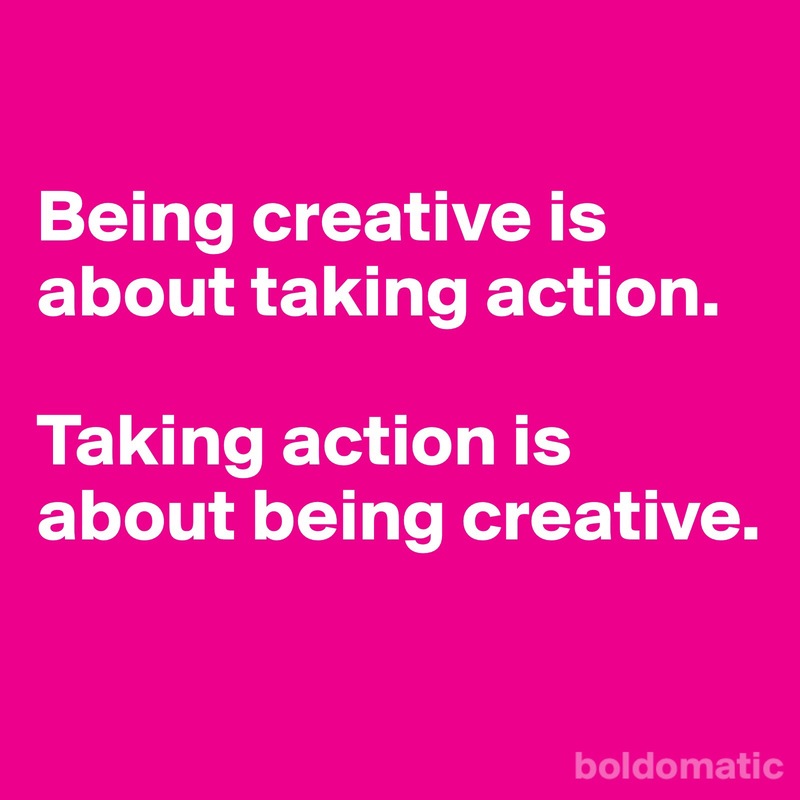 Being creative is about taking action. It’s about just doing something, making something come to life. Whether it be a song, a meal for the family, a painting, a website, a blog post or an email asking someone for assistance. Taking action is about being creative, it’s about taking steps towards a goal, or just taking a step forward anyway, because it feels appropriate to take a step forward. It’s just different words. And it became painfully obvious to me, that I place totally different meaning upon these two words. Which is actually a great piece of information! If I’m paralysed by the Be creative-bit, well then, don’t go there. Use the Take action-vocabulary instead, by all means. And vice versa. If Taking action feels very serious, strict and rather makes your imagination and creative playful side shut down, inhibiting you from actually taking action, well, then use words like Be creative instead. Simple right? Because neither is more right or wrong than the other. It’s just two different ways of getting things done. Of making stuff happen. And trust me on this my friend, making things happen is a key factor for progress, for movement, for learning, for expanding. So whatever you do, make stuff happen! And perhaps play with these two concepts to find out which gets your juices flowing? Each time you eat you have a choice, whether or not to put something in your mouth that brings you either towards health or towards unhealth. Now, I am very conscious about food and know what’s healthy etc, but still – the simplicity of this statement brought me to a stand still. I froze. And realized the beauty of actually putting it down to this, each and everytime I either eat or drink. Because sometimes I might not care, I’d rather choose something yummy and totally bad for me than refrain. And that’s fine. Because othertimes I’ll choose to refrain or to pick and choose more carefully, in order to actually bring me towards physical health. Now, for some things I’d rather have a once-in-a-lifetime-choice to make rather than having to decide each and every time. But for other things, not so prone towards the never-again-option that pops into my head when I think about this. For the #cleanse4expansion project I’m currently running, I decided when I started to do a minimum of 15 minute of daily cleansing. Easy. Choice made. Mind made up. And yup, I’ve stuck by it, because I said I would. But when it comes to eating and drinking, I’ve certainly thought about it a lot, but haven’t made any decisions like that. Yet. Might. Who know’s right? But still. The ”stop eating crap all the time”-diet certainly appeals to me. That’s for sure. And I don’t. Eat crap all the time, that is. Once in a while, yup. Haven’t gone absolute on this. Yet, as I just said. I might. I am certainly well on my way to a severely reduced crap-intake, that’s for sure. Being flexitarian I very rarely eat meat (and when I do, it’s very seldom ”industrial-grade” meat), on account of this our skillet is very rarely used, I eat more and more organic food, lots of fruits and vegetables, my morning green smoothies are to die for, the raw food balls I make are an excellent snack together with a handful of (organic and soaked) almonds, and so on. But am I a purist? No. Not at all. I eat the occational take-away pizza. Chips, cakes, popcorn, desserts. I eat candy. Or at least did. Am contemplating cutting candy out of my diet actually – with the exception of chocolate. I love chocolate, dark, organic, preferably plain. Yum. Well. You get the picture. And the thing is, being more aware that there is a choice to eat/drink my way towards health or unhealth makes the choice to go for the healthy stuff easier and easier. But it all comes down to one thing: I feel better. I have more stamina. My body and I are becoming good friends. I listen more to what my body is telling me, and I am more loving towards it. I want it to thrive! 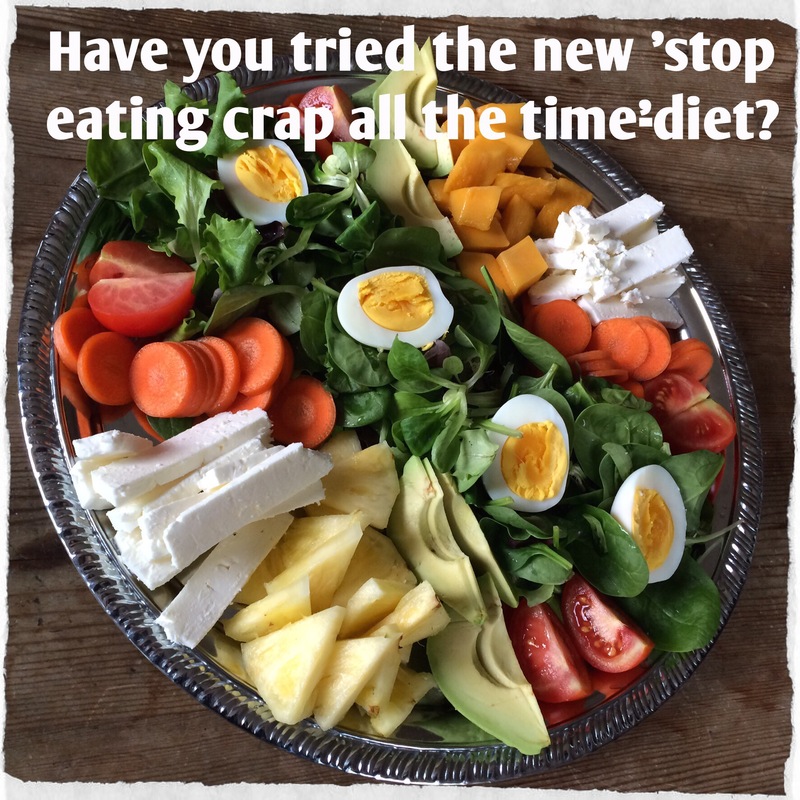 So, have you tried the new ”stop eating crap all the time”-diet yet? Tar tåget hem från Stockholm. Promenerar bort till cykelparkeringen på andra sidan kanalen. Noterar att mitt röda regnskydd på cykelkorgen som Skånetrafiken förärat mig för något halvår sen verkar vara lite öppet. När jag parkerade cykeln där dagen innan la jag ned min cykelhjälm i korgen och snörpte åt regnskyddet. Nu är det definitivt uppsnörpt. Kommer närmre och tittar ner i korgen. Cykelhjälmen borta. Ahmenvafaaan, börjar tankarna spinna. Vem faaan snor en cykelhjälm? Alltså, vad är det för fel på folk!!! Tittar mig omkring, i närbelägna cykelkorgar, på trottoaren, i vägrenen osv. Sno en väl (!) begagnad cykelhjälm, vem tusan gör det? Irritationen växer inom mig, och i just den stunden får jag syn på mina tankar. Inser att jag inte vill ägna 20-25 minuters cykeltur i en stegrande irritation. Så jag ignorerar den senaste tanken, och funderar istället kring det faktum att kanske det är någon som verkligen var i behov av en cykelhjälm som blev överlycklig av att hitta en liggandes i en cykelkorg. Kanske den kommer till nytta hos sin nya ägare, och kanske, kanske, så räddar jag, eller min fd cykelhjälm rättare sagt, ett liv endera dagen. Genast känns det mycket bättre och jag blir tom lite småglad vid tanken på att min bättre begagnade cykelhjälm åker Malmö runt och skyddar skallen på någon som saknade en hjälm. Känns riktigt bra till och med. För vem vill inte vara med om att (potentiellt åtminstone) rädda ett liv? Vad betyder det att misslyckas? Och varför är vi så rädda för att misslyckas? En av de enklaste och samtidigt mest betydelsefulla förklaringarna på det där med att misslyckas fick jag höra från Dennis Westerberg. Han sa nått i stil med att ett misslyckande är en åsikt. Misslyckandet är inte själva resultatet, för resultatet är till sin natur neutralt. När man sätter sig för att åstadkomma något, så finns två möjliga resultat. Ett önskat och avsett resultat, eller ett oönskat icke-avsett resultat. Det finns två utfall: antingen får du det önskade och avsedda resultatet, eller så får du det inte. Fakta. Konstaterande. Misslyckande å andra sidan är åsikten som vi, ganska slentrianmässigt och ofta helt i onödan, lägger på det icke-avsedda resultatet. Hänger du med? Och håller du med? Steg nummer ett för mig är att se och erkänna det neutrala i att uppnå, eller inte uppnå, ett visst resultat. Att tanken på om något är lyckat eller inte är en åsikt kring ett faktum, snarare än ett faktum i sig självt. Det andra handlar om varför vi är så rädda för att misslyckas. Och jag skulle tro att du kan se vad svaret är på det också. Rädslan ligger ju i åsikten. Åsikten för vad andra ska tycka, tänka, säga kring mitt ”misslyckande”. Frågan är ju varför det spelar roll? För egen del, så säger det något om vilken betydelse jag lägger vid en viss människas (grupp av människors) åsikter. Att jag bryr mig om vad någon säger om det resultat jag levererat (vare sig det är det avsedda eller ej), handlar inte egentligen om resultatet i fråga, utan om den personens åsikt. Den åsikten kan jag faktiskt bemöta på samma vis som jag bemöter mitt resultat – som något neutralt. Vi faller i fällan att tro att någons åsikt spelar stor roll, och har inverkan på vårt välbefinnande, men det är de facto våra tankar om det hela som påverkar oss och avgör vårt välbefinnande. Jag tar ett exempel. Låt säga att jag experimenterat i köket och lagat mat utifrån vad som finns i kyl och skafferi. Vi sätter oss till dukat bord och börjar äta. Om familjen då är av olika åsikt, dvs barnen tycker det smakar vedervärdigt medan maken gillar det – vad ska jag dra för slutsats av det? Är det ett misslyckande? Eller ett halvt misslyckande? Eller ska jag bara inse att resultatet blev en ätlig middag, som vissa tyckte om, och andra inte tyckte om. Om jag då lägger enorm vikt vid barnens åsikt, oj så misslyckad jag kan känna mig av det. Om jag istället tar det för vad det är, att middagen helt enkelt inte föll dem på läppen, tja, då samlar jag bara på mig fakta som säger att just den hittte-på-rätten lämpar sig bättre för kvällar då barnen inte äter hemma. Neutralt. De facto. Känner jag mig misslyckad då? Nä. För jag har bara samlat information som jag kan dra nytta av i framtiden, eller hur? Vad skulle hända, om du testade att se på dina resultat framöver som information, som datapunkter, istället för att du ålägger dem en betydelse att de säger något om dig och ditt värde? Och i synnerhet, vad skulle hända, om du testade att se på dina oönskade och icke-avsedda resultat framöver som information, istället för som misslyckande? Nånstans nångång tänkte jag följande tanke: När spelare förändras så förändrar sig spelet. 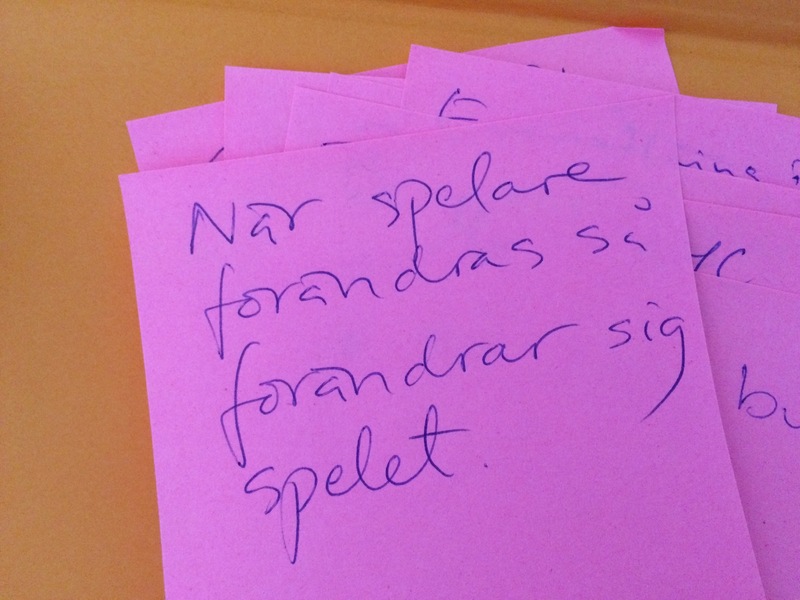 Skrev det på en PostIt-lapp som jag sedermera fotograferade och la i min Evernote. Har fladdrat förbi ögat emellanåt när jag varit inne i Evernote. Varje gång så hummar jag tyst för mig själv, för så är det ju. Klart att spelet förändras när spelarna förändras. Jag kan se det i det lilla, ta familjen som exempel. Om en av familjemedlemmarna förändras – personlig utveckling, plötslig sjukdom, förälskelse eller någon annan av alla otaliga anledningar som kan föranleda en personlig förändring – så förändras dynamiken i hela familjegruppen. Det går även tydligt att se i t ex fotbollslag och dylikt, där en förändring kan påverka enormt, både positivt och negativt. Och om det är sant i det lilla, då är det sant i det stora. Det betyder, i mina ögon i alla fall, att jag som enskild individ kan spela oerhört stor roll i att åstadkomma en systemförändring. Jag som älskar att fundera kring stora system och strukturer, och i stort pockar på för att skapa systemförändring, blir samtidigt uppmuntrad av tanken på att man inte måste gå det hållet, dvs förändra spelet i syfte att förändra spelarna. Det är något hoppingivande i att det funkar på båda hållen. Fast på sätt och vis är det kanske så att individen alltid sitter på trumfkortet. För man kan ändra spelets regler, utan att en spelare förändras, eller hur? Hur många företag har jag inte varit på där omorganisation efter omorganisation lik förbaskat inte föranlett avsedd förändring, eftersom spelarna (dvs medarbetarna) inte köper det nya spelreglerna eller den nya spelplanen. Och omvänt, givet exakt samma spelregler/-plan, så kan allt förändras om spelarna förändras. När spelare förändras så förändras spelet. När individer/medborgare förändras så förändras samhället. Samma sak, bara uttryckt annorlunda. Så hur förändras en spelare då? Via en tanke. Det är den minsta gemensamma nämnaren för att åstadkomma en förändring i en individ. En tanke. Det är allt som krävs. En tanke, som öppnar för en annan syn på världen. Så enkelt, och hoppfullt. Samtidigt så svårt. För gudarna ska veta att jag ibland fastnar på en tanke, som snarast gör mig än mer fastrotad, och totalt obenägen till ett tankeskifte. Men ett tu tre så släpper jag taget om den gamla tanken, ofta helt omedvetet, och då, med lite flyt, dyker en eller annan ny tanke upp. Där öppnar sig världen igen, där finns möjligheten till förändring. Och händer det mig så lär det hända dig. När spelare förändras förändrar sig spelet. Väcker frasen lika mycket hopp i dig som den gör i mig?